Can you smell what the pitmasters are cooking? 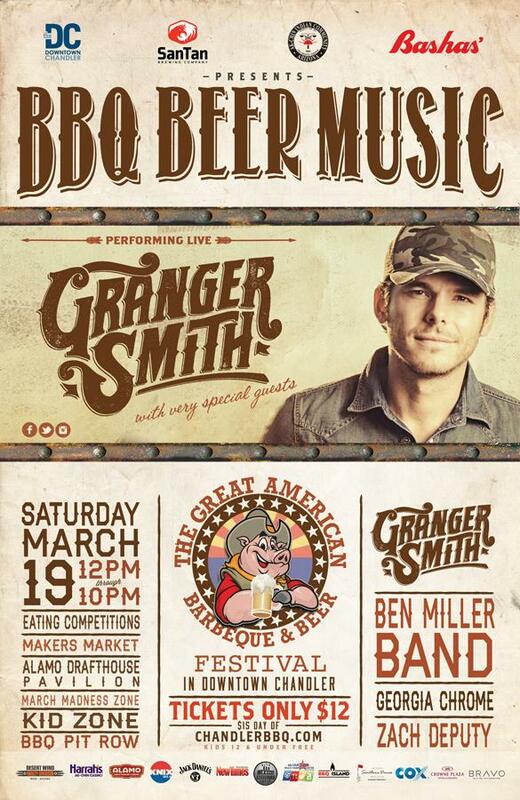 This Saturday, March 19, 2016, Arizona’s largest BBQ event, the Great American Barbecue & Beer Festival, returns to downtown Chandler from noon – 10 p.m. with 20,000 lbs of BBQ, 200 kegs of craft beer and 20 bands. Headlining this year’s entertainment will be Granger Smith, best known for his hit single, Backroad Song from his 4×4 EP. Supporting acts include the Ben Miller Band, Zack Deputy and Georgia Chrome. Hungry BBQ fans can expect delicious grub from many of the Valley’s top BBQ joints, serving up a range of mouthwatering dishes, including ribs, pulled pork, brisket, chicken and more. Restaurant highlights include Smokehaus, Tom’s BBQ, Porkopolis BBQ, Montana BBQ, Raging Cajun Smoking BBQ, The American Poutine Co, Honey Bear’s BBQ and many other vendors dishing out some finger lickin’ good food. To wash it all down, enjoy over 200 kegs of locally brewed craft beer from SanTan Brewing, including their new seasonal Grapefruit Shandy and everyone’s favorite Mr. Pineapple wheat beer. During the Great American Barbecue and Beer Festival, guest of all ages can participate in a variety of themed zones, including the Kids Zone, the Live and Local Stage, Bravo Fan Experience, Food Eating Competition Zone, Desert Wind Harley Davison Pavilion, March Madness Lounge and more entertaining zones. The seventh annual Great American Barbecue & Beer Festival will be held in downtown Chandler, spanning the entire east and west Dr. AJ Chandler Park – as well as the connecting Arizona Ave., which will be closed from Buffalo St. to Boston St. on Saturday, March 19, 2016. General admission tickets are available online for $12 at www.chandlerbbq.com and $15 at the gate. Children 12 years of age and younger are admitted for free. The Great American Barbecue & Beer Festival official sponsors include; Bashas’, SanTan Brewing Co, Ak-Chin Indian Communities, Downtown Chandler Community Partnership, Alamo Drafthouse Cinema, Crowne Plaza San Marcos, Chandler Office of Tourism, Alta Steelyard Lofts, Alliance Beverage, Crescent Crown Distributing, 102.5 KNIX, Jack Daniels, Earnhart Dodge Chrysler Jeep Ram, Discount Cab, Desert Wind Harley Davison, BBQ Island, Phoenix New Times, Local First AZ, and Yelp Phoenix who all remind you to enjoy BBQ and beer responsibly. ← Previous Previous post: Kale Yeah! It’s Kale Poblano Dip! Next → Next post: Go Bold With Tacos Featuring Bravado Spice Co. Hot Sauce!